Quick update on Tristel (TSTL). Summary: Oh dear — these results were something of a letdown :-( It seems TSTL’s projections of c%15 revenue growth have been dropped as UK turnover starts to stall. At least now we know why December’s AGM statement never mentioned sales! A startling £1m share-based payment and a signal for a pedestrian 5% dividend lift were other features I did not expect. Though I still hold TSTL, I have been selling during recent weeks and sold more today. I mentioned in December that I was a little surprised that TSTL did not disclose a first-half revenue figure within its AGM statement. AGM updates for both 2014 and 2013 had contained such numbers, and I was worried the omission suggested the top-line had not performed as well as management had hoped. As it turns out, first-half revenue growth was indeed below what TSTL had previously projected for 2016 and 2017. Today’s announcement revealed the top-line had advanced 8%. In contrast, TSTL’s previous two sets of results had confirmed the group was targeting c15% annual revenue growth between 2014 and 2017. (It is now somewhat galling to look back to last October and recall that TSTL claimed the “pace of our growth could accelerate”!). The lack of any reference to the c15% growth target in today’s statement suggests that goal has now been quietly dropped. The lower-than-expected revenue increase was due to stalling UK sales. “Our clearest challenge at this point in our development is to counteract the anticipated slowing of sales growth in the United Kingdom. We will achieve this through a combination of targeting more rapid growth in overseas markets and a steady pipeline of new product launches. Slowing growth in the United Kingdom is due to the very high levels of market penetration that we have achieved in the clinical areas of the hospital that we target. I was not expecting that news. I mean, during October’s results webinar, TSTL’s managers had previously expressed confidence of further NHS demand for the company’s disinfectants, and had cited ophthalmology as one of a number of clinical areas that could create extra UK sales. Now we are told that UK revenue advanced just 2% during the half-year, all of which was driven by greater sales of veterinary- and cleanroom-related products. UK revenue from the main medical wipes and hospital disinfectant division actually fell 2%. This stalled UK performance compares to a 10% improvement for UK revenue reported at the previous annual results. Clearly something has happened in the UK division — and I trust tomorrow’s results webinar will reveal all. In the meantime, I must admit to kicking myself for overlooking the H1/H2 split of UK revenue from last year. H1 was £5.0m and greater than H2’s £4.8m — with hindsight, that lower level of H2 UK revenue may have been a warning sign. Given the state of UK sales, I am relieved TSTL’s overseas divisions improved their combined top line by 20% to represent 36% of total revenue. TSTL still plans to submit a regulatory application for two products to be sold in the States this year. Last October, the group mentioned it wanted to “establish a presence in most countries within Central and South America by 2017”. Quite possibly the best ratio to emerge from these figures was the operating margin. Adjusting for share-based payments (see below), a first-half operating profit of £1,470k represented 18% of overall revenue. TSTL’s prior levels of profitability had been in the low-to-mid-teens, so I am pleased the value of the group’s proprietary chemical formulation is now starting to shine through. However, a “substantial investment” is still required to gain regulatory approval for US product sales. For what it is worth, the chaps at broker Equity Development estimate this US investment will amount to £600k over the next 18 months. TSTL reckons it can keep its pre-tax margin above 15% during this investment phase. But the group did admit the investment would mean profit during the upcoming second half would be similar to that reported for this first half. Usually the second half is more profitable than the first. I have to confess I did not expect these results to carry a £1,015k share-based payment! Past TSTL results have always showed share-based payments of £50k or less, and I have taken little notice of these sums. “During the period an unusually large share-based payment charge of £1m was incurred, which is worthy of explanation. This non-cash expense is calculated on the fair value of share options granted in the period and is higher if the options have vested. The Company has run an all-inclusive staff option scheme for many years and with the increase in the Company’s share price since its low point of 20 pence in February 2013, the majority of staff scheme options have vested. “In addition to the staff share option scheme, a senior management scheme was agreed by the Board in April 2015. This scheme was based on certain profit and share price performance conditions over a three-year period. On the date the scheme was approved the share price was 70 pence (23 April 2015) and on the date the scheme had been documented and announced the share price was 96 pence (4 August 2015). An overriding vesting condition of the scheme was the share price reaching and staying at or above £1.34 for a period of thirty consecutive dealing days. …because I am convinced if today’s 8% revenue growth figure had been published in the AGM update, the share price would not have stayed above 134p during December — and those particular options would not have vested! All told, I get the impression the directors have been somewhat sharp here. TSTL declared a 1.14p per share interim dividend and said it would represent 40% of the current-year payout — that is, 2.85p per share. I am surprised the annual dividend was not greater. I mean, 2.85p per share is only 5% higher than the ordinary 2.72p per share payout declared for 2015. Such a pedestrian improvement for what is a small, growing business might be a signal of more caution to come. At least I could see no problem with cash generation to fund future payouts within today’s statement. …I come to earnings of £2.2m or 5.3p per share after £150k of share payments and 20% tax. 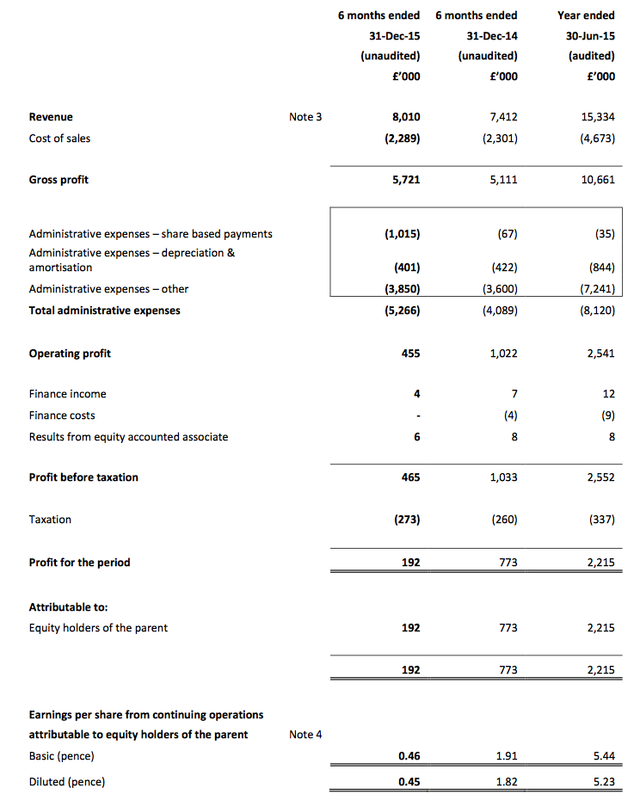 Taking surplus net cash to be £4.3m or 10p per share, my estimate of TSTL’s enterprise value is £42m or 100p per share. Then dividing that 100p by my 5.3p earnings guess, the trailing cash-adjusted P/E comes to 19. Crikey — that multiple still appears a bit rich given near-term revenue may now advance at about 8% a year rather than 15%, and the annual dividend is being raised by only 5%. I mentioned in October to having a few nerves about i) TSTL representing 18% of my portfolio, and; ii) the share’s premium rating. So between the start of January and yesterday, I managed to sell 22% of my holding at 137.6p. And following today’s statement, I offloaded 19% of my remaining holding at 123.2p. With the shares now at 110p, in hindsight I should have sold more before today! Anyway, those disposals mean I have reduced my TSTL position by around 38% since the start of the year. Whether I should be selling more TSTL today remains to be seen. The current rating may look a little punchy, but there are few businesses around that enjoy patented-protected products, decent cash-rich books and significant overseas growth potential. In the years to come, I am hopeful today’s statement will simply be seen as a short-term blip. Finally, I will be tuning in to tomorrow’s results webinar with keen interest. Credit to TSTL’s executives here — they are happy to host these events after great results… and the not-so-great! This entry was posted in My Shares, Tristel and tagged Tristel, TSTL on February 24, 2016 by Maynard Paton. No sign of that speculation in the latest note. Funny that. A cynic may suggest the speculation was added to help the shares stay above the magic 134p. Excellent and very interesting write up. I like how you flag the “tricks” the company has used to duck and dive about its performance & options. Thanks LLG. I would prefer not to have to write about such “tricks”, but sometimes it comes with the territory. I can’t prove any skullduggery has happened of course, so I may be adding 2 and 2 and getting 5 with all this. For my own record, here are the questions I’ve submitted for this afternoon’s webinar. Let’s see what gets asked and what the responses are! 1) 2017 revenue target: The previous two results statements had cited a 2017 revenue target of £20m — implying c15% per annum revenue growth. No mention was made of that revenue target in yesterday’s results. Has that £20m target now been dropped? And if so, what is the revised 2017 revenue goal? 2) UK revenue: During the October 2015 webinar, management anticipated further organic growth in the UK. Particular quotes included a “huge opportunity” in ophthalmology and “growth in all areas, UK and overseas, continuing in the short term, in the next couple of years”. So what has happened since October’s bullish tone? UK revenue appears to have stalled. Do UK hospitals no longer need many more medical wipes, surface disinfectants etc? 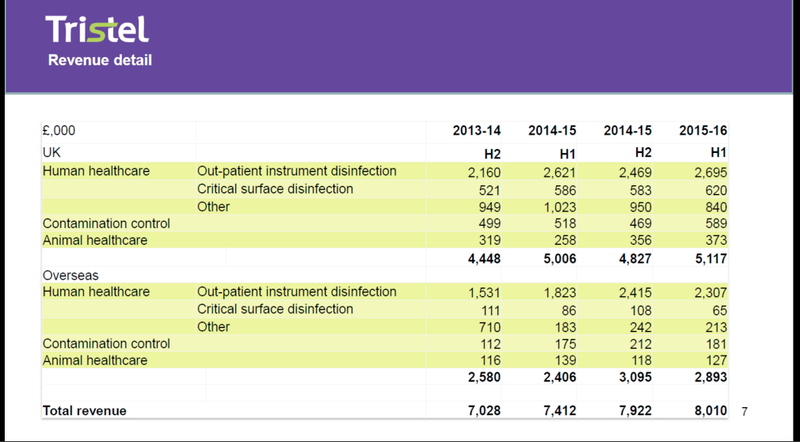 It would be very useful if management owned up to what exactly has occurred in the UK, as well as disclose the UK revenue figures for wipes, surface disinfection and ‘other’ for H1 2016 vs H1 2015. The October 2015 webinar did divulge the figures for FY 2015, which were £5,090k for UK wipes, £1,169k for UK surfaces and £1,973k for UK ‘other’. 3) AGM statement: December’s AGM statement did not reveal that first-half revenue had advanced by 8%. However, AGM updates for 2014 and 2013 did reveal the revenue advances for those half-years. So can management explain why it delayed disclosing the below-expectations revenue advance until these results, when the figure should have been known (and revealed) at the December AGM. (A cynical shareholder may think that the delayed disclosure was due to management trying to keep the share price above 134p to collect certain options). 4a) FDA approval: Can management confirm that FDA submission is still on track for June 2016 and an outcome is still on track for June 2017? 4b) FDA approval: Can management outline the possible reasons why FDA could REJECT its submission and the likelihood of such a verdict. 5) Share-based payments: Equity Development understand the share-payment charge will reduce to £100-200k/year. Is that management’s understanding, too? 5b) Share-based payments: Was the full cost of the senior management option scheme agreed in April 2015 all expensed in H1 — despite the share-price condition not being met after the period on 6 Jan? The statement does not make it clear. Some clarity as to what was expensed in relation to this particular scheme — and how much more of it there is left to be expensed — would be useful. 6) Underlying dividend: It seems the current-full-year dividend will be 2.85p — just 5% ahead of the payment for 2015. Can management explain the pedestrian payout uplift, especially given its comments of a “very promising” outlook in the statement. 7) Market size: The preliminary results presentation given during October 2014 claimed the instrument decontamination market into which Tristel then sold was valued at £91m. The £91m value was based on 32.56 million procedures throughout Western Europe, China/Hong Kong, Russia and Australasia, which each procedure valued at £2.80. 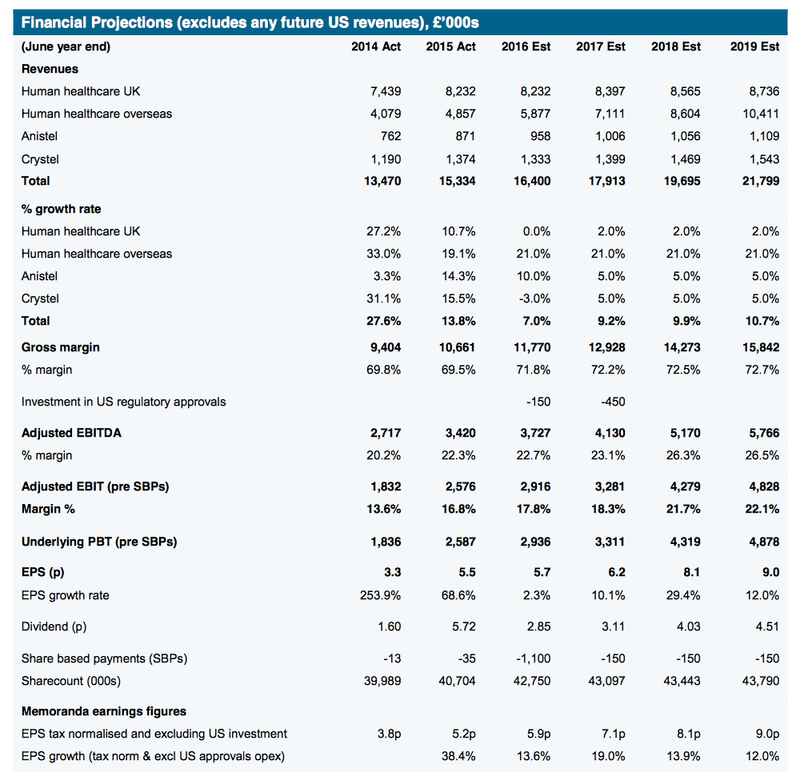 Can management provide an update to the £91m market value? Or at least some rough guidance as to where the estimated 32.56 million procedure number and £2.80 procedure value now stand. Can management explain the “major break-through” and whether there is a genuine likelihood of any handsome licensing deal with Unilever etc. Excellent and honest analysis. Of late I have come to put management’s integrity and competence very high up in my list of criteria for investment. Especially with AIM companies. With respect to TSTL I don’t recall them giving cause for concern until today. Unless I am mistaken and I didn’t read earlier signs. Just for the record, it appears TSTL’s share price traded at or above 134p from Monday 23 November 2015 to Wednesday 6 January 2016 — the magic 30 trading days that triggered the vesting of certain options. The AGM was held on Tuesday 15 December 2015, day 17 of 30. So I have listened to this afternoon’s webinar and scribbled down some notes. I hope they all makes sense. Most of my questions were asked, and credit to TSTL’s management for hosting these events. * £20m revenue for 2017 now “unlikely to be achieved”. * Presenting a new 3-year forecast has not been resolved by the board, due in part to being unsure of “how to articulate” a 3-year plan that encompasses what could be a major event (FDA approval). * Management did claim the £3m pre-tax profit originally projected for FY 2017 was now on course to be achieved one year early (FY 2016). * Apparently the NHS has for the first time in many years become “very difficult” to sell into and “without doubt is in financial distress”. “The speed we can capture new business will slow”. * Gist of NHS problems is that “faceless decision-maing purchasing procurement” is no longer keen to spend money on extra disinfectants. * TSTL claims the “argument will be won eventually”. * Still on track for a verdict in summer 2017. * Registration costs have come to £60k in FY 2015 and £40k in H1 2016, and will come to £80k in H2 2016. * Costs of full submission will then add an extra £400-500k to the bill. * If approval is won, no material costs of USA operation. There will be no US subsidiary or presence. * US approach described as “relatively risk-averse”. * FDA has never approved a high-level foam-formatted disinfectant before, nor has it approved a high-level chlorine-dioxide disinfectant before. 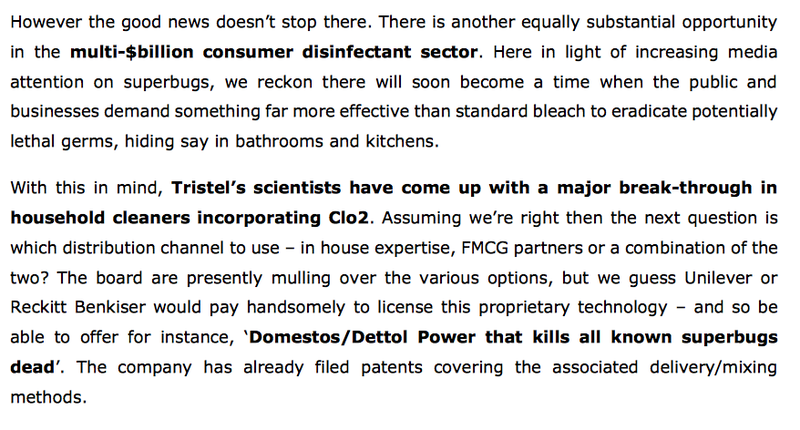 * But the FDA has approved a chlorine disinfectant (from UK firm Sterelox) and a foam-y type (hydrogen peroxide nebuliser) disinfectant (from Australia) before now. So there is some hope that all will be well with TSTL’s submission. * £100-200k charge estimates “err on the high side”. Past annual charges ranged from £15k to £100k and will probably revert back to that level. * Seems like TSTL may have had a rollicking from institutions on this issue as it was clearly explained right at the start of the webinar. * Anyway, H1 contained the whole charge, there will be no repetition of the charge in H2 and no planned repetition of this LTIP in the future. “A once and for all thing… at least for the next 3,4,5 years”. * Dividend growth remains based on 2x EPS cover. Tax at 18% (vs 13%) and greater share count has had some effect. * Cash in bank still at £4.3m. * Research still “holds true”. £2.80 value per procedure remains the case, and the value is higher in the UK. * TSTL has 15 active substances that fall under new BPR rules. Each cost £70k-100k to become BPR-approved. * 2 products already dropped, losing £200k of revenue in H1. * For FY 2016, some £700-800k of revenue will be lost. * Products involved are all low- or no-margin and do not use the core chlorine-dioxide formulation. Lost production will free up capacity to manufacture higher-margin products and lift gross margins. This Comment summarises my thoughts on TSTL, which surprised me last week with a disappointing set of interim results. To cut to the chase, last week’s statement revealed the group’s previous revenue guidance would now be “unlikely to be met”… and that the senior management team had just earned itself a £1m option windfall. I wrote at the time that I had my suspicions about management’s behaviour. I have no proof that the board has done anything wrong, and no doubt the executives can point to the AIM Rules and say nothing has been breached. It’s just that reading TSTL’s past RNS statements has now given me some doubts about the leadership quality of this business. So let’s start by going back to December and TSTL’s AGM statement. “This is the sixth consecutive reporting period in which we will have achieved year-on-year profit growth. We expect unaudited pre-tax profit for the first half to be no less than £1.4 million, compared to a pre-tax profit of £1.1 million for the same period last year – an increase of at least 27%. The full year profit for the year ended 30 June 2015 was £2.6 million. The Board believes that performance continues to be in line with market expectations. All looks fine, until you realise there is no reference to revenue. The lack of any revenue reference was odd as the two previous AGM statements both mentioned such figures. The absence of a revenue figure did surprise me at the time, and I did wonder whether the omission “may indicate the top-line did not perform as well as management had hoped”. You see, throughout 2015, TSTL had been confident about its near-term revenue performance. Results issued in February 2015 and October 2015 had both cited (in the RNS) a £20m revenue target for 2017 — implying near-term revenue growth of roughly 15% a year. It was a bold, public prediction, and naturally shareholders had considered this revenue target in their own valuation sums… which was reflected by TSTL’s c70% share-price gain recorded during 2015. Importantly, TSTL’s management was given the opportunity to clarify its first-half revenue performance at the AGM. Now at the time, all of this could have been viewed as something about nothing — especially as the AGM statement had claimed “Growth is coming from all areas of the business”. What’s more, the directors had bought a few shares on the day of the meeting. Last week’s results revealed first-half revenue had grown by 8% — some way short of the c15% growth rate that had been projected by TSTL’s management for 2016 and 2017. TSTL’s management confirmed during the results webinar — but not actually in the results RNS — that the £20m revenue target for 2017 was now “unlikely to be met”. Stalled UK revenue — the NHS has apparently become a much more difficult customer — was cited as the main reason for not reaching the original goal. It all led to TSTL’s shares dropping 20% on the day. Anyway, my suspicion is that TSTL’s executives must surely have known at the December AGM that first-half revenue would be up only 8% — and that the original £20m by 2017 target would now be “unlikely to be met”. I mean, past AGM statements had indicated first-half revenue figures… yet management remained tight-lipped — even when pressed at the meeting. Now you could say management has done nothing wrong here. For one thing, earnings for the current year are set to meet forecasts because of higher margins — so the lower revenue expectations might not really have constituted ‘price-sensitive information’. Furthermore, the NHS difficulties may have started only after the AGM. And/or perhaps the firm’s broker has given some bad advice about market communication. Normally I would try and give management the benefit of the doubt with this sort of setback, because the future is always uncertain and disappointments can always happen. But in this particular situation, I have my doubts. Indeed, it just seems so obvious to me (at least now) that a revenue figure ought to have been included in the AGM statement — and the market could then have decided for itself whether that figure constituted ‘price-sensitive information’ or not. Furthermore, overall UK sales have been at a standstill for 18 months now, which suggests the NHS difficulties are nothing totally new. Oh, and TSTL found no problem communicating its original £20m revenue target to investors. “Tristel plc (AIM: TSTL), the manufacturer of infection prevention, contamination control and hygiene products, announces today that Paul Swinney, CEO and Elizabeth Dixon, Finance Director, have been granted options over 636,567 ordinary 1 pence shares (“Ordinary Shares”) under the Tristel plc Performance Share Plan 2015. The options are exercisable at 1 pence per share subject to certain profit objectives being met or the share price of the Company being equal to or greater than 134 pence per Ordinary Share for a period of 30 consecutive dealing days. What was not said at the time — and revealed only last week in the results presentation — was that there were 1.2 million options granted and that they would all vest immediately if the 30-day share-price condition was met. The original statement certainly reads to me that vesting on any condition would only occur after the 2016 results, and in three separate tranches. Anyway, last week’s results confirmed the 30-day share-price condition had been met and the interim results carried a £1m share-option charge (a substantial sum when annual operating profit (pre-option costs) currently runs at about £3m). …and day 17 was 15 December, the day of the AGM. Now imagine you are part of TSTL’s senior management team. You have been awarded part of 1.2 million options at 1p each, and the share price has been at or above 134p for 17 days. So there are just 13 more trading days to go before you collect part of a £1m-plus option jackpot. It’s a tantalising windfall — and one that appears to at least double your team’s annual pay (the 2015 annual report cites “key management” — including the two executives — received total compensation of £944k last year). But you have to issue an AGM statement. What do you do? …but I suspect TSTL’s management deliberately withheld a revenue figure from the AGM statement for fear of missing out on the £1m-option windfall. …and thus leave this £1m-option award dangling for another time. As I say, I have no proof of these suspicions and perhaps the executives have instead been caught out by an unfortunate set of coincidences. Still, I can’t help feeling TSTL shareholders have been misguided by the wording of both the AGM statement and the option grant in August. As such, my faith in TSTL’s management has been dampened somewhat and I have disposed of more shares. I mentioned in the original Blog post above that I had sold 38% of my shareholding between the start of the year and 24 February. After further reflection, I have sold 33% of my remaining holding last week for 107.5p including all costs. This latest disposal means I have cut my TSTL position by about 58% since the start of the year. Why not sell more? Well, TSTL’s medical wipes and its other disinfectants are high-margin products that are used day in, day out in the vast majority of UK hospitals — so the business retains many operating and financial attractions… and may not need superb executives to do quite well. There is decent overseas expansion potential, too. And of course, I may be completely wrong about my suspicions about management. But right now, I feel it’s a shame that TSTL’s boardroom now looks to be of much lower quality than the products the firm is trying to sell. And with the shares trading on an above-average rating and previously representing a large chunk of my portfolio, I couldn’t afford to have too many management doubts. Let me finish by wondering if TSTL’s executives have been keeping an eye on their other options. The exercise price of these particular change-of-control options is 65p and most expire during October 2019… so there are less than four years to perhaps find a potential bidder. I would be more than happy if/when TSTL’s managers exercise these change-of-control options for a very fat profit.